A Drop Zone is a region inside a Final Cut Pro X template that allows you to add an image, or audio file, to the template from within Final Cut Pro X. The benefit to a Drop Zone is that it inherits all the animation and effects you applied to it in Motion, while still allowing you to select the affected clip from within Final Cut. 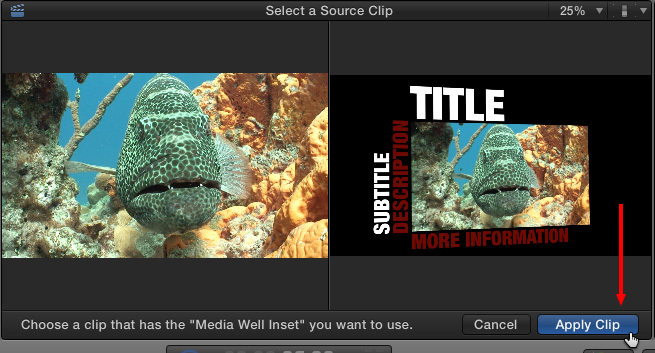 For example, this is the “Bold Fin” title opened in the Inspector. The Drop Zone is indicated by a downward pointing arrow. The words “Media Well Inset” will vary by effect. The key indicator for a drop zone is the icon itself. 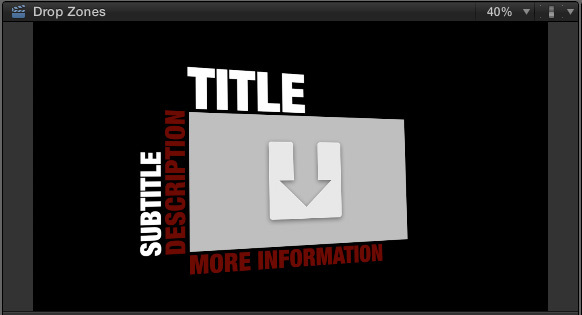 Here’s the same title in the Viewer, where the gray box and downward pointing arrow represents the Drop Zone. Click once on the Drop Zone icon in the Inspector. In the Browser, or Timeline, click the clip you want to insert into the Drop Zone. … And that clip now appears as a video clip in your effect. To change the clip that appears in a Drop Zone, simply repeat these same steps, but pick a different clip. To empty a Drop Zone, click the small “X” in a circle to the right of the Drop Zone. 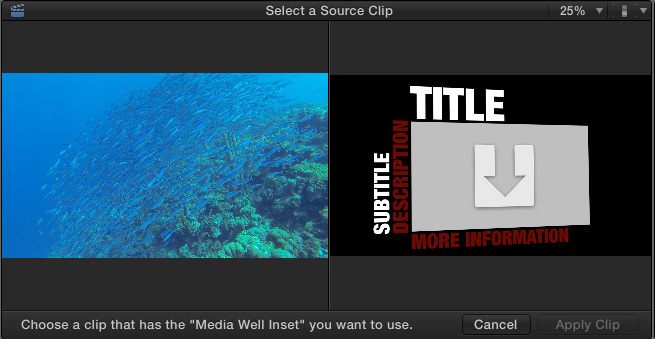 In the past, FCP would not recognize the In of a clip for use in a Drop Zone. This made it really difficult to select just a portion of the clip that did not start at the beginning. For example, here is a clip from NASA that has a major shot change – from red to yellow sun – about ten seconds in. 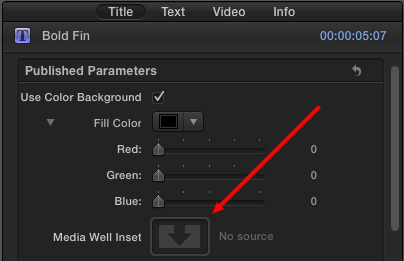 When adding a clip to a Drop Zone, FCP now starts the clip in the Drop Zone from the point at which you click. So, if you want to exclude a portion of the clip – for example, here, I want the sun shot to start with the yellow, not red, sun – click at the start of the yellow sun shot to determine where the Drop Zone starts. 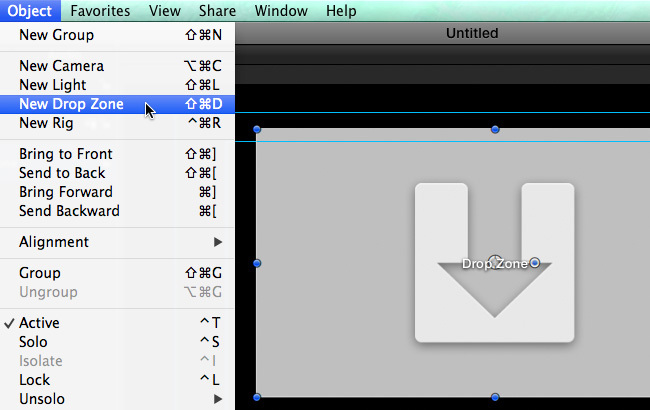 Drop Zones are created in Motion when either you or the effect developer creates the original effects template. This means that you can apply animation or filters to the Drop Zone in Motion then, when you save the template for use in Final Cut, all those affects are then transferred from Motion to Final Cut and applied to whatever clip you add to the Drop Zone in FCP. I often want to use a still frame clip in a title or effect Is there an easier way than creating a still frame in the timeline, turning it into a compound clip, then dragging it into the drop zone? Having done this I sometimes find that later the rendered image turns up “missing” and I have to repeat the process. Still images, stored in the Browser, should work as well as a video clip. When I click on the drop zone Icon in the inspector, then highlight a video clip in the timeline, a still image of the highlighted clip appears in the drop zone. However, when I play the clip, there is no moving video, only a still image of the video. I am taking a clip from the timeline, because the video is shot on green screen and I want the keyed image in my drop zone. Any ideas why it won’t play? (FYI- I can drop the raw green screen video clip from the browser into the drop zone, and it plays just fine)? Hmm… no clue. Perhaps another reader has a suggestion. Larry, I’m having the same problem. I created a generator in motion with three drop zones. This is for a video podcast using a recorded Skype call with 3 people. So the video in the timeline is 3 separate video streams with their own audio tracks that need to sync up. When placing each steam into the drop zones via the inspector all I get is a still no motion but the audio is playing. If I select video clips from the browser it plays but audio is not synced properly. And video is not edited. Any ideas? Am I doing something wrong? I believe the reason that we get a still image is because of bug that was introduced. The video start is not based on where we click anymore, but it is now offset by the duration of the Drop Zone placeholder. So when the video runs out it freezes. 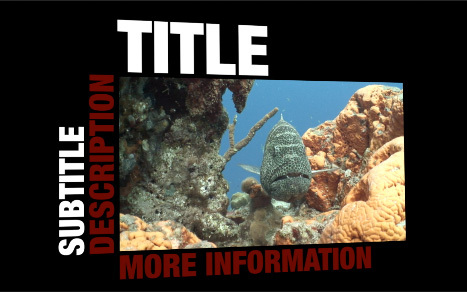 I’m trying to change the font color in the Bold Fin title element to complement a specific color from the photo in the drop zone. All I find in the “Face” menu is a color grabber. Is there a way to specify a color using RGB or HEX codes? Click the color chip in the Face menu – NOT the downward pointing arrow. This opens the standard Macintosh color picker. Click the second icon from the left on the top. Change the popup menu from Grayscale to RGB. On the right you can enter RGB values. At the bottom, you can enter Hex codes. Thanks Larry. Such a simple solution. I shouldn’t fall victim to thinking that all menus appear with the carats. Sorry for the delay in replying. The short answer is create a dummy title, add a still, then delete the still and see what happens. You MAY be better off exporting the still frame (File > Share > Export Still Frame) this creates stand-alone media that you can import and use as any other media clip. Given what you are doing, I would recommend this.